"The total yearly costs of neck and upper extremity pain in the Netherlands (population of 16.4 million) due to decreased productivity, sick leave, chronic disability for work and medical costs were recently estimated at 2.1 billion euros (Blatter et al, 2006)." People, especially young adults, are spending increasingly more and more time connected to their computer (Subrahmanyam, Kraut, Greenfield & Gross, 2000). At school or home they send emails, chat and surf the net, and sit behind the computer eight hours a day at work. Even when going on vacation, they stay connected to the internet through their "Blackberry" or the Wi-Fi connections at hotels and coffee shops. Employees are often on call 24/7 (twenty four hours a day, seven days a week) 365 days a year. The combination of intensive computer use and work demands has resulted in an increase (epidemic) of illness (Kalia, 2002). For example, more than 30% of employees who work at the computer experience neck and back pain; hand and arm pain, tingling and numbness; and exhaustion ( Chauhan, 2003) . The European Agency for Safety and Health at Work (2004) has reported that more than a third of European workers complained of back-ache. The largest increase in back-ache are seen among computing professionals and technicians. More than 25% of European experience work-related neck-shoulder pain and 15% experience work-related arm pain (De Kraker and Blatter, 2005). This report suggests that the complaints are most prevalent among people who spent more time on the computer and work continuously without breaks. Beside professionals, college students (average age 25 years old) also report significant discomfort while working at the computer during the periods of high stress (e.g. the later part of the semester when papers and exams are due) as shown in figure 1 (Peper & Gibney, 1999). Fig 1. 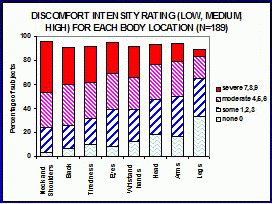 Distribution of discomfort for different body areas. Categories high, medium, low are derived from the responses on the self-rating discomfort scale (0=none to 9=extreme). In Japan, "Karoshi", death from overwork, accounted for more than 5,000 suicides in 2006 (Hida, 2008). Furthermore, Japan had the highest proportion of people working more than 50 hours per week, with 28.1 % as compared to less than 10% of employees working more than 50 hours per week in most EU countries (Hida, 2008). Another alarming statistic described by Hida (2008) is that the ratio of employee use of paid vacations dropped to 47 percent in 2004 from 61 percent in 1980. This paper suggests that overwork without opportunity for regeneration or repair places people at significant risk for experiencing technostress (Burke, 2008).